Elmer “Bud” Eugene South, Jr. passed away October 29, 2018. Bud was a sweet soul that always helped many friends. He was an amazing spiritual father, pastor, father, son, husband, grandfather and friend. He served the Lord until he went Home. Bud is survived by two sons; one son-in-law; one daughter; one daughter-in-law; one brother; three granddaughters; four grandsons; two granddaughters-in-law; five great grandsons and five great granddaughters. The family will receive friends for visitation at Pensacola Memorial Gardens Funeral Home Monday, November 5th from 1:00-2:00pm with funeral to begin at 2:00pm. I have been blessed to call you friend. We have shared many joys and many heartaches over the years. I was sitting in church on Oct 21st and had an urge to text you “Gods not dead!” and you text me back “who told you He was?? ?” “just proclaiming the truth” then you said “Amen girl. Love you” I could always count on you for the straight up answer to any question, even if it was not what I wanted to hear. Bud was an amazing man and servant of God. This man will always hold a very special place in the hearts of our family. His entire life was a dedicated to sharing the Gospel of Jesus Christ and I am honored to call him a brother in Christ. There is a great celebration in Heaven. Bub is home with Jesus and many loved ones. 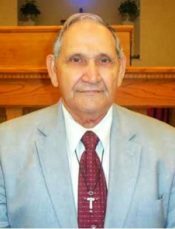 Brother Bud was a very sweet and loving person and pastor. He will be dearly missed. May he rest in peace with Jesus and be with his sweet wife sister Phyllis.